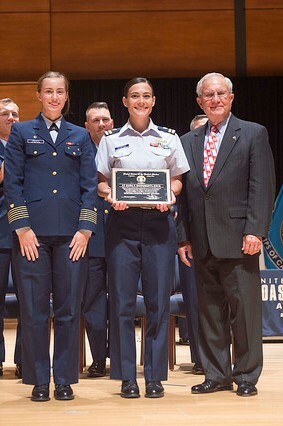 Presentation of the 2018 Junior Officer Instructor of the Year award was given at the U. S. Coast Guard Academy convocation on 23 August 2018 to Lieutenant Dana Dougherty, USCG. Companion RADM William F. Merlin presented the award, with Cadet 1/c Eileen Brewer, the Regimental Commander, alongside, representing the Corps of Cadets. Annually since 1989, the Naval Order of the United States, in cooperation with the Superintendent of the Academy, sponsors the Coast Guard Academy Junior Officer Instructor of the Year Award to recognize the exceptional personal, professional and academic leadership, and commitment to learning exhibited by a junior officer of the rotating faculty. The presentation is made at the Academy’s Convocation Ceremony when the entire Corps of Cadets assemble with Academy faculty and staff, guests, and friends to begin the new academic year. This award is most distinctive because the recipient is chosen by the Corps of Cadets. 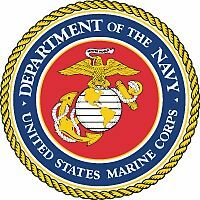 LT Dougherty has been given a lifetime membership in the Naval Order of the United States, as part of the award recognition.